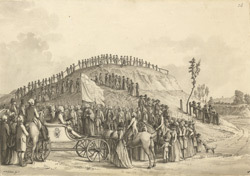 King George III and Queen Charlotte at the "Montem"
bl.uk > Online Gallery Home	> Online exhibitions	> Topographical drawings	> King George III and Queen Charlotte at the "Montem"
A view of the ceremony of the "Ad Montem" (Latin: to the hill), at Salt Hill near Eton College, as attended by King George III and Queen Charlotte. King George was devoted to Eton College and frequently attended school functions. The College so respected its royal patron that it adopted his birthday on June 4 as a school holiday, when the event was (and still is), marked by cricket matches, speeches and a regatta.